Vertebral compression fractures are a significant clinical issue with an annual incidence of approximately 750,000 cases in the USA alone. 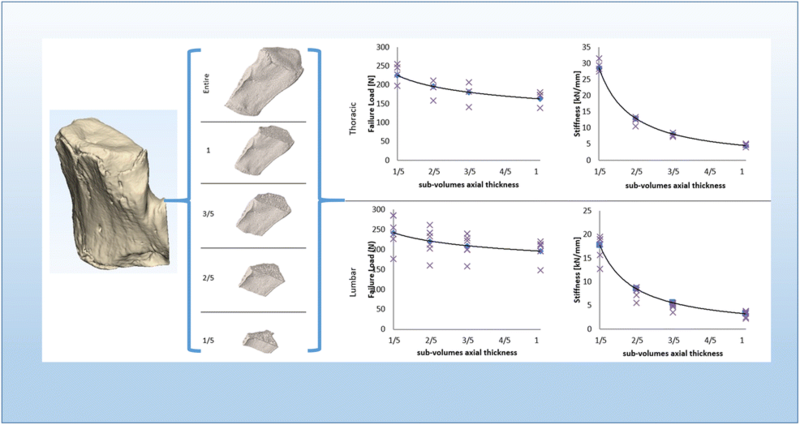 Mechanical properties of vertebrae are successfully evaluated through finite element (FE) models based on vertebrae CT. 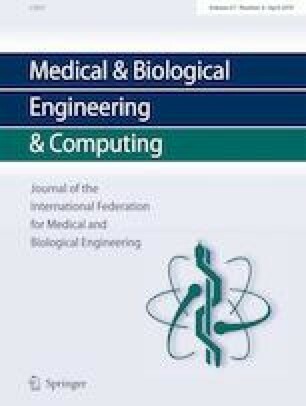 However, clinical drawbacks associated to radiation transmission encouraged to explore the possibility to use selected or reduced portions of the vertebra. The objective of our study was to develop a new procedure to predict vertebral compression fracture from sub-volumes. We reconstructed rat vertebras from micro-CT of thoracic and lumbar groups. Each vertebra was partitioned into three sub-volumes of different axial thickness. FE simulating compression tests were performed on each model to evaluate their failure load and stiffness. Using a power function, a high correlation was found for stiffness and strength. The sub-volume with three fifths thickness had a failure load of 180.7 ± 19.2 N for thoracic and of 209.5 ± 27.4 N for the lumbar vertebra. These values were not significantly different from the values found for the entire vertebra (p > 0.05). Based on our findings, failure loads and stiffnesses obtained with reduced CT scans can be successfully used to predict full vertebral failure. This sub-region analysis and power relationship suggests that one can limit radiation exposure to patients when bone characterization is needed. The work was partially supported by the Aurelio M. Caccomo Family Foundation. F. Mainnemare’s abroad research was fully funded by Fren ch Ecole Normale Supérieur Paris-Saclay.